The proliferation of smart metering devices, SCADA and other network-enabled sensor devices is resulting in an explosion of data volumes in water utilities everywhere. But many utilities are still dealing with a variety of built-for-task systems that cannot integrate or 'talk with each other.' We can help you get all of your internal systems connected and then augment that information with available public and commercial data sources. Your database is the foundation upon which your decision automation strategy is built. Our cloud-based data warehouse is simple and fast to implement; you'll start seeing results in a couple of weeks, not months or years like with many projects. 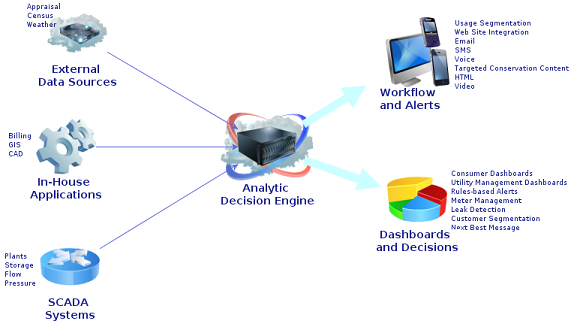 You, your customers and your engineers can all view relevant information though the H2O Analytics dashboard, or you can embed our analytic widgets into your existing software or web-site. Our algorithms watch your data stream and react intelligently. Analytic models and business rule management technologies allow massive volumes of sensor data to be handled correctly, every time, with minimal human intervention. We can integrate with your existing systems, allowing us to apply analytic intelligence to data coming from your existing operational workflow systems and then push these 'decisions' back into the existing systems. For example, we can examine your meter inventory and usage history data to predict which meters should be replaced next and then create work orders in your system to initiate the work. Long range development planning can be complicated by the fact that different entities rely upon different "views of the world." A state regulatory agency may view the world through USGS 7.5 minute quadrants, while city governments and other authorities may have different geographic boundaries. H2O Analytics helped one utility analyze their customer data, combined with appraisal data and demographic data, by USGS 2.5 minute quadrants, state environmental commission boundaries, and utility service area boundaries. The ability to quickly generate statistics and visualize the results, in various schemes, makes communicating with various stakeholders much more efficient.